OK, I’ll buy into this stupid damn argument, that has really just arisen to fan the flames of social division, and I know I’m helping the left by contributing, but damn it all, the whole thing was started by the National Party anyway, which just shows how politically confused they are (see below posts). 1) Its not an issue of racism its an issue of nationalism. Chinese live in many parts of the globe and we don’t have a problem with those outside China. For example those that live in Singapore. Because they’re not organising and contributing to a large scale invasion and occupation of a sovereign nation. The buyers driving Auckland’s house prices into the stratosphere are coming from the People’s Republic of China. If they changed the name to the People’s Republic of Fandango, we’d probably be calling these invaders Fandangoese. If they were from any other centrally located country or community, we would be calling them by whatever name was appropriate. IT IS A MATTER OF NATIONALITY NOT OF RACE…!!! 2) Across the West the left/ progressive forces are striving to incrementally break down the old order and replace it with the new. That is what mass one way immigration into Western countries is really designed to achieve. So not only do we have the National party, which should be standing firm against this strategy, buying enthusiastically into it, we also have them adopting left wing arguments against stopping it. A complete and utterly crazy inversion of political objectives and methods. I’m sure the Nats are doing it out of confusion, stupidity and because their core ideas have been corrupted beyond recognition over the last few decades. However, I also think that real estate agents and various other groups, including buyers from the PRC, are making a fortune from the invasion, and therefore not at all averse to passing on some of these gains into the National Party’s election coffers. I’m sure this too is colouring National’s thinking on the issue. The whole lot of them are politically bankrupted, morally too in many cases. I think they want the money these people bring with them. 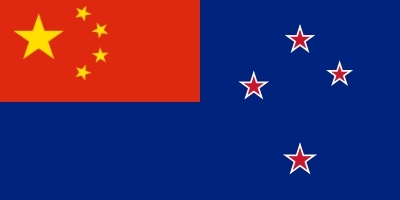 The NZ flag replacement is classic out with the old, & in with the new. Whatever that turns out to be. It is alarming that bells are not ringing in the heads of Nat supporters, but they don’t want to mess with Key & his cohorts. If it has a label with national painted in blue, thats enough for them. Yes, you’re on to it Peter. Why don’t they wake up? That the same thing is happening in almost every Western country should be enough to alert any rational person. In almost every Western country the forces that have previously held the responsibility of keeping the left back have succumbed, and now act as the very forces they once opposed would act. In the US, Canada, Australia, the UK, and of course NZ, the so called small govt pro-individual parties have all been infiltrated and diverted completely from their original values. And still we have a majority of navel gazing loons out there saying its all just the way the world moves. Utter nonsense. It is happening by design and intent. I’m sure that it has happened more by accident but that National are unwilling to put an end to it as these people are not the usual welfare bludger type of potential voter import ie potential Labour supporter. These are financially successful people irrespective of how they came by the money; they are just following the footsteps of many of the wealthiest families in the Western world who did not come by their wealth honestly. This is also nothing new to New Zealand with the Chinese having brought in lots of money before when every Aucklander subdivided their quarter acre and sold off the old house on the front half and built something new for themselves at the back. Was that in the eighties? Selling property to foreigners has always been a source of foreign exchange for New Zealand. Think of it as a sort of Mortgagee sale. We buy stuff and borrow to pay for it, lets call it a trade deficit, they then use that trade deficit to buy assets. Something back rather than nothing. For the mathematics to work, we have to sell assets, its as simple as that. It’s certainly an issue of Nationalism but I don’t think National MP’s know what that is. In the last few days Joyce has been a major disappointment and when he mentioned democracy on red radio I choked on my porridge. The sheer magnitude of change that can be foist on this country by this massive investment from Chinese is scary and we have a bunch of gutless politicians that don’t know what they stand for or who they represent . OMG – John Stringer has really lost the plot. The Conservative Party was always doomed with these politically confused numpties running it. I think he is actually Korean. It is simple enough. Why can’t they get it? Amen brother! I’m an Asian Kiwi and I agree. There are tonnes of Chinese nationals buying up this country; I’ve been saying it for years. Finally there is a public debate in this country!